Jordan, J J, Grebby, S, Dijkstra, T, Dashwood, C and Cigna, F. 2015. 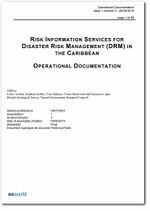 Risk information services for Disaster Risk Management (DRM) in the Caribbean. British Geological Survey Internal Report, OR/15/001. This page was last modified on 4 December 2015, at 11:13.